Investor Junkie is engineered to educate people about the personal finance space, while helping them become better investors. Taking the fear out of investing, Investor Junkie provides all the essentials of investing, while communicating the ways in which consumers can make the most of their investments. Setting users up for financial success, Investor Junkie houses a wide range of reviews, comparison tools, insightful articles and promotions. In 2016, Investor Junkie partnered with Bowen to strengthen their user experience, increase site engagement and ultimately have a greater impact on search engine optimization. Our partnership with Investor Junkie drastically improved the user experience, leading to increased onsite user engagement, time on site, pages per user, conversion rates and overall website rankings. Due to the company's unprecedented success, Investor Junkie was acquired for $5.8 Million by XLMedia in July, 2018. Our team built three new comprehensive, customizable financial comparison tools to deliver a personalized and seamless user experience for every site user. A financial comparison tool with advanced search filter functionality that enables users to compare products, advisors or companies, based on in-depth ratings and reviews. The Best Of Tool ranks top-rated financial services based on their overall scores. Dependent on user preferences, the tool re-ranks the list to best suit their needs. Detailed review pages for each product and service, with a restructured navigation and a wide variety of features designed to strongly improve the user experience. Provides a customizable side-by-side comparison and detailed breakdown of reviews for users to make a highly informed decision when choosing their financial services. The tool provides a thorough breakdown of the best financial services, and acts as a guide for users to build a firm understanding of the best service for them. Each review is jam-packed with information to provide users with a terrific starting point to learn everything they’ll need to know before taking the next steps. Using this research-based comparison tool, users now have an interactive way to make an educated decision when choosing a financial service based on their needs. By customizing the top ten best financial services in multiple categories, users can choose to read full length reviews or open an account at the press of a button. An essential component of the website, the review pages now provide a seamless user experience while all pages are easily manageable through a custom backend review post. The previous navigation limited users in finding exactly what they were looking for right away. It did not successfully represent Investor Junkie's website as a vast and leading source of information, due to its minimal structure. We updated the navigation to serve as an easily accessible overview of the whole website, restructuring it to house all the resources for those who want to begin investing. A robust, yet user-friendly navigation housing all tools, products, reviews, articles and resources for web visitors to easily find what they are looking for. Users now have easy access to read helpful reviews instantly, utilize new comparison tools that didn’t exist before and discover a wealth of resources right at their fingertips. Without a single click, the updated navigation now shows users on the Investor Junkie website just how many more resources they have instant access to. 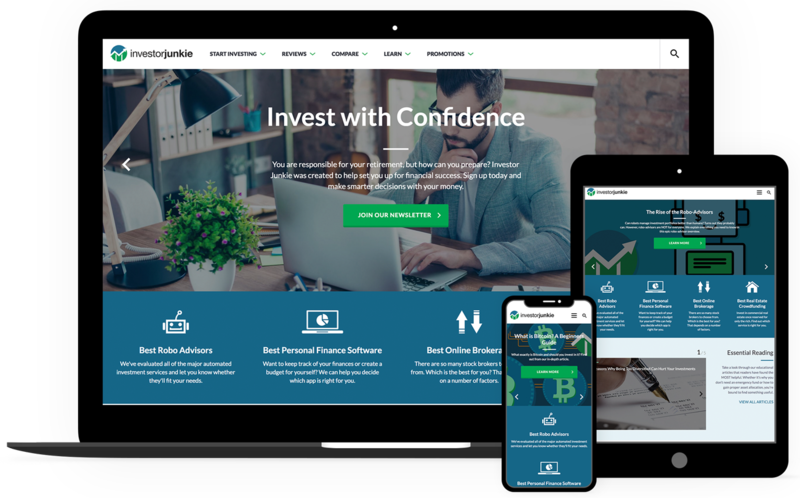 We improved the styles throughout the website to increase user engagement and sitewide legibility, leading to higher conversions for Investor Junkie. Creating a brand that stayed neutral enough to showcase a wide array of other brands, while remaining uniquely and unmistakably branded as Investor Junkie. Adding legible typefaces, branded infographics, icons and intriguing color palettes greatly enriched the user experience.